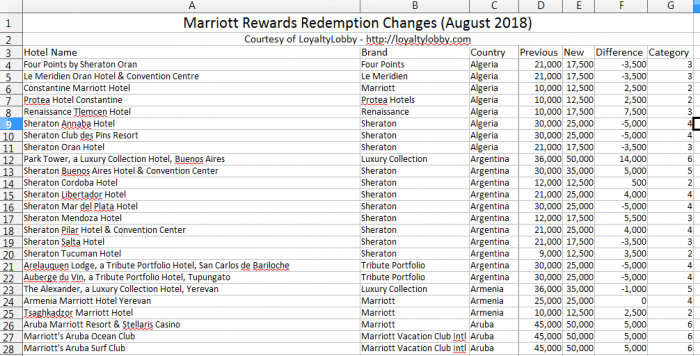 Marriott Rewards yesterday released their combined award chart for all properties including SPG and Ritz-Carlton (read more here), and decided greatly devalue the much loved Travel Packages (read more here). The website for award rates is very comprehensive but we thought that it would be always good idea to have these in a downloadable spreadsheet. Makes it easier to sort the properties and make searches when offline. You can access Marriott’s web page for the combined award charts here. I have more thoughts about this combined award chart later today with some graphs. Good to have this award chart saved (elsewhere than on Marriott’s website from where it will disappear in due course) so that we can compare the coming devaluations in 2019 and 2020 to when the programs were merged in August 2018.